If you love ice cream sandwiches but are looking for a healthier indulgence, add these tasty treats to your shopping list ASAP. 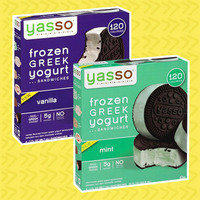 They come in Vanilla and Mint, both with dark chocolate cookies and 5 grams of protein packed into each dessert 'wich! 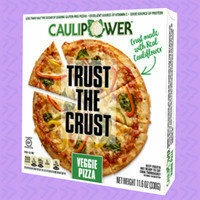 Find them at Target, Walmart, Kroger, Publix, and more. 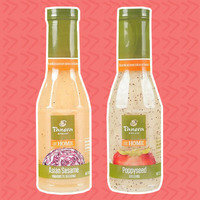 Fans of Panera Bread's salads can now make 'em at home! These four low-calorie salad dressings are made from clean ingredients, in line with Panera Bread's recent menu overhaul. (There are other varieties in the line as well, but those are higher in calories and fat.) Click to find! Hot trends from Natural Products Expo West! We visited this year's Natural Products Expo West, and as always, we sampled so many amazing new products! Some of the hot trends you can expect on shelves soon: protein-enhanced everything, not-your-usual popcorn (skinless, mini, and more), non-dairy nut spreads, edible cookie dough, and chocolate-covered savory snacks! Many of the actual products aren't available just yet, but we'll give you the heads-up as they start popping up. Exciting! It's official: Bottled water is the new soda. Soda, you're just not cool anymore. According to new data on last year's purchases, for the first time ever, sales of bottled water outpaced those of carbonated soft drinks. Bottled H2O has been on a steady increase since 1977, and it finally surpassed soda's reign. Need a little help getting enough agua? Click for tips. Welcome to the Foodnited States, courtesy of Pinterest. Spread the news... this news, specifically! Click "Send to a Friend" now.